* Tree maintenance within the Town's rights-of-way. If you have any questions for the Public Works Department, please contact trey@townofsilt.org or at (970) 876-2353, Ext 106. Trey has been with the Town of Silt since August of 2007. He became the Public Works Director in September of 2017. Trey has the hours equivalent to an Associates degree in Business Management from Lake Land Junior College in Mattoon, Illinois. He currently holds a Level 4 Collections license, as well as a Level 3 Distribution license, a Class D Wastewater Operator license and a Class C Water Operator license. The Public Works Department recently completed construction of a new irrigation tank (below grade), fence, and cover, located about the old town shop parcel (648 N. 7th Street), and below Eagle's View Subdivision. If you have any questions about this project, please do not hesitate to call Public Works Director Trey Fronner at (970) 876-2353 Ext. 106. Town of Silt Public Works crews have finished installing a new playground at Flying Eagle Park at 16th and Grand Streets, adjacent to the Town's soccer fields. The playground is designed for ages 5 to 12. 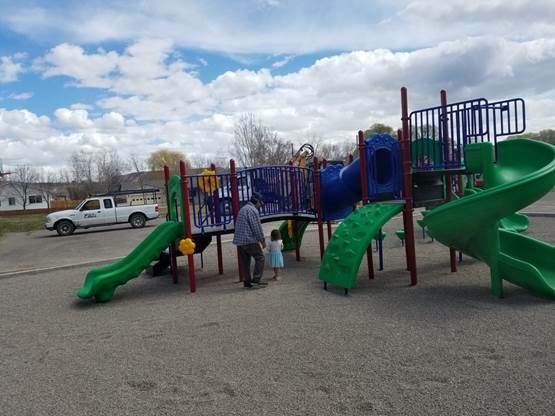 Town staff did all the work associated with installing the new features, including removal of asphalt and dirt, installation of small block wall, concrete work, installation of the playground equipment and the washed rock for fall protection. The cost of the project totaled $25,000 and was paid out of the Town's Park Impact Fee Fund. The Town was responding to requests from folks in the neighborhood who pointed out the need for a playground on the east end of Town. The Town of Silt Board of Trustees awarded the Pioneer Drive water main replacement project bid to Canyon Excavating, for $183,476.50. The Federal Mineral Lease District granted the Town $208,634.43 and the Town will utilize $86,398.85 out of the combined Water/Wastewater Fund. This project will begin shortly. If you have questions, please do not hesitate to call Public Works Director Trey Fonner at (970) 876-2353 Ext. 106.